Yes, We’re Backwoods. And Fertile Ground ... And Deep Seas ... And Extraordinary Wildlife. - Mississippi Believe It! Home » Resources » Campaign » Yes, We’re Backwoods. 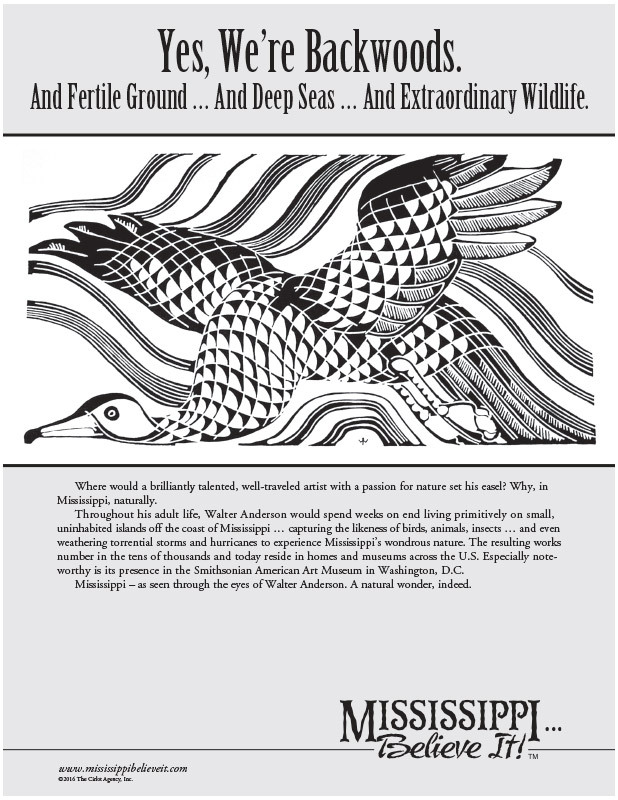 And Fertile Ground … And Deep Seas … And Extraordinary Wildlife. Where would a brilliantly talented, well-traveled artist with a passion for nature set his easel? Why, in Mississippi, naturally. Throughout his adult life, Walter Anderson would spend weeks on end living primitively on small, uninhabited islands off the coast of Mississippi … capturing the likeness of birds, animals, insects … and even weathering torrential storms and hurricanes to experience Mississippi’s wondrous nature. The resulting works number in the tens of thousands and today reside in homes and museums across the U.S. Especially note- worthy is its presence in the Smithsonian American Art Museum in Washington, D.C. Mississippi – as seen through the eyes of Walter Anderson. A natural wonder, indeed.